CHANGE OF CIRCUMSTANCES AND OUR NANNY HAS PULLED OUT. We are an Australian family living in big house on the beautiful Gold Coast. Care needed for 2 young girls (1 at school). Most weekends off, although may require the occasional weekend or night. Easy going family. 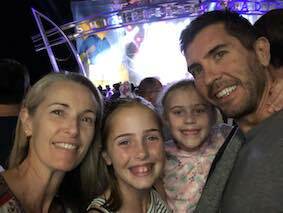 We are an Australian family with 2 young girls aged 6 and 11. Sophie is at school 5 days a week which is walking distance away, and Ivy has just started school! Although Ivy does has a condition called speech aspraxia which means she has speech and language difficulties. There also appears to be a global development delay in her learning. At the moment she goes to a speech pathologist 1 day per week and the current au pair spends time helping her with speech based activities. The host Mum works 5 days a week and the Host dad owns a few restaurants and bars works also works 5-6 days. We need help getting Sophie and Ivy to school, home from school and other after school activities, as well as other regular household duties. Weekends will usually be free for the au pair to enjoy the beautiful Gold Coast beaches and outdoor lifestyle. The host parents are well travelled, friendly and pretty stress free. Our home is on the water, and big enough so we won't be living on top of each other. We are seeking a like minded nanny who is lots of fun, with lots of energy, and who will enjoy their time with us. We hope that they would want to be part of the family and would enjoy hanging out with our family not just when they are are 'nannying'. Prefer someone who has nanny-ed before, just so that they know what it's like to live with a host family, and understand the 'give and take' that makes a successful relationship between host and nanny. Preference will be given to anyone with any experience with speech disorders or nursery/childcare teachers. We have had nannies for the last 5 years so we are well experienced with this situation and the nanny we have at the moment is fabulous so they re big shoes to fill! These nannies are also available as references for us if you would like to speak with them.